Profit ➔ Purpose : rather than viewing profit as the primary goal of an organization, it is seen a byproduct of success. Controlling ➔ Empowering : The people with best insight and decision-making ability are often people closest to customers or at the front line. You achieve better results by inspiring and empowering people at the edges to pursue the work as they see fit. Planning ➔ Experimentation : resources devoted to planning are a less valuable investment than embracing agile methods that encourage experimentation and fuel rapid learning, a long term vision is still needed though. Hierarchies ➔ Networks : it is no longer necessary true that coordinating through a manager is more effective than people self-organizing as a network with increased autonomy. Privacy ➔ Transparency : the potential benefits of trusting people who share the organization’s purpose to act on information as they see fit, often outweighs the potential risk of open information being used in counter-productive ways. This vision shares common traits and values with “Teal Organizations”, “Holacracy„, “Agile movement”, “Lean Startup”, among the others. As of today, the Responsive Org Community counts up 37 regular meetup events on five different continents. In Switzerland alone there are currently five Responsive Org communities active in Zurich, Bern, Basel, Lugano, St-Gallen-Bodensee. During a Responsive Org Meetup it is common to go through an Open Space process and build up the agenda dynamically as it fits participants. The last Responsive Org Zurich meetup on May 25 took place at Impact Hub Zürich Colab and the open space marketplace brought us the following topics. Jean-Paul Munsch presented an educational model of school evolution that can be applied in different school types, in order to move into the Teal stage. The first step is to define the evolutionary purpose (Evolutionärer Sinn). The basic question “What do I really wish for myself and for others?” links the individual to broader perspectives, and at the same time heads and teachers take responsibility for what they want to give to the word, which leads to the second step. If we take responsibility (Verantwortung übernehmen), energy formerly lost in resisting to others, complaining about and fighting against , is set free for constructive work. Suddenly “there is nobody else to blame for what I am doing”. This is the key to breathing life into an evolutionary. The third step is to let teachers work in professional learning communities (Selbstorganisation), where they experience an environment in which learning from each other and peer feedback can grow. The head or headmaster is the key player in this structural systemic transformation process. He is the one who can hand over responsibility to build structures and processes that enable team work and self-managing teams. This breaks up the paradigm of individual isolation. 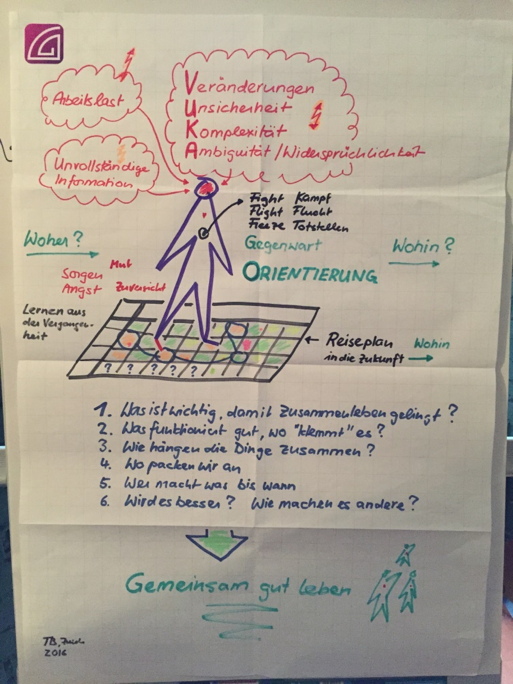 If every activity is in alignment with the purpose, teachers learn to work in a process-oriented way, and discover their self-empowerment, their possibility to shape their school (Entscheidungsprozess). 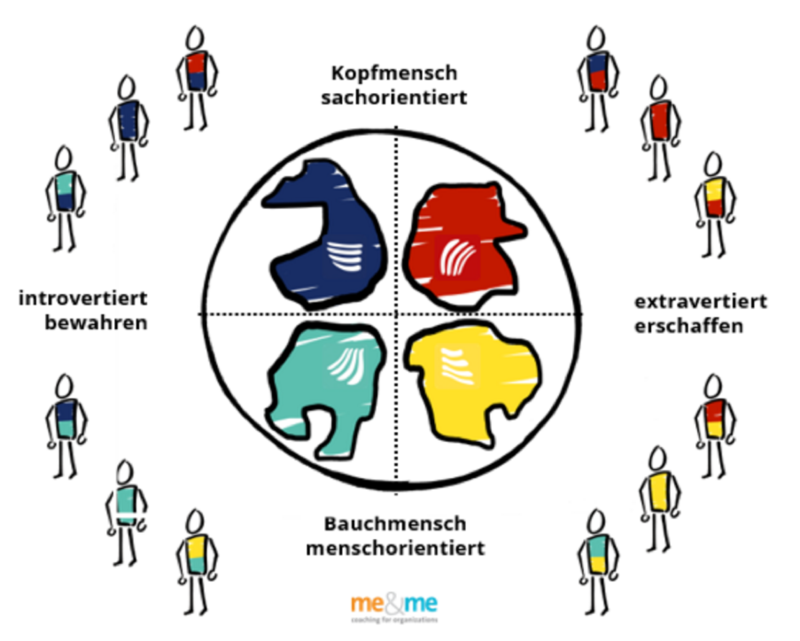 That means to integrate the individual into a a group of professionals, and to integrate all perspectives to find an integral shape for the system (Ganzheit). Following topic focused the individual level, in a combined session about “how to establish a teal mindset”, and “how can we get a collective insight for an individual intelligence”, animated by Thomas Braun and Ralf Metz. Nowadays changes at the work place happen at a sustained rate, and individuals are experiencing difficulties in handling complexity, heterogeneity and ambiguity in the rapidly evolving environment. Thomas view focucs on how these conditions the individual may incur the “VUKA” mode (Veränderungen, Unsicherheit, Komplexität, Ambiguität), in which basic reactions such as Fight (Kampf), Flight/Escape (Flucht), and Freeze (Totstellen) can be triggered. Once in this mode, one can stall and remain blocked, unless help comes from the surrounding, often in the form of careful coaching. Answers to questions such “where do I come from” (Woher) and “where am I going to” (Wohin) need to be answered first, to re-establish a general sense of direction. We need to learn from the past, give expression to our feelings, passions and worries, and our talents. Once some positive feelings are identified, we assume these as reference points in the “map of the unknown”, and start walking again. The process need to involve the team, building a collective map, towards working and living well together in the community (Gemeinsam gut leben). In the approach proposes by Ralf, a teal mindset always starts with knowing and understanding yourself better. Each individual brings a different variety of strengths and weaknesses combined with own experience. Understanding this variety enables me to understand other’s point of view. Personal awareness is the first step, in order to be authentic one has to first figure out his individual basic attitude, positioning on a four quadrant polarity scheme including introversion vs extroversion, rationality vs intuition. The second step is moving outside this awareness, by re-shape the own rating schemes. This enables me to know better what is important for others and what are their qualities. The third step is to become conscious of my goal, and to interact in a way that suits the others team members qualities, which brings to more constructive manner in the context of the team. The third and last session of the meetup brought to us further notable true life examples of Responsive Organizational practices, including Holacracy at AFCA, Glassfrog and Hola Spirit tools, Integrative Decision Making process, with concluding remarks by Dariusz Klupi about the importance of dealing with emotions at the work place. In this Reponsive Org meetup instance we had the chance to see the power of collective learning in action, driven by purpose, sponsored by headmasters, and assisted by careful coaching. Although changing traditional organizational models it’s not a trivial journey, the payoff is “joy at the work place”, where energy is set free for constructive work, and empowerment is achieved.